System that enables a Homelift to continue in operation for numerous trips after a blackout, reduces the peak consumption to 200W, turns the lift into a regenerative one and makes it possible to add solar panels. 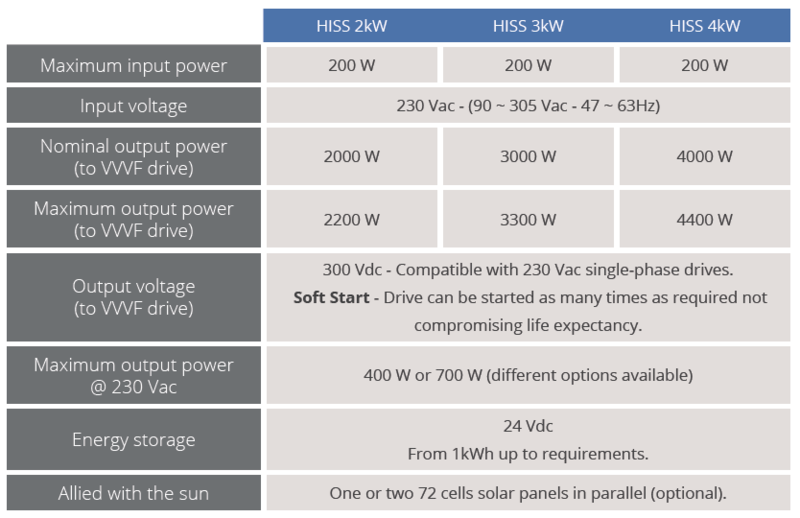 HISS is an intelligent supply system for electric HOMELIFTS that feeds the elevator from a single-phase mains socket with only 200W peak power consumption. 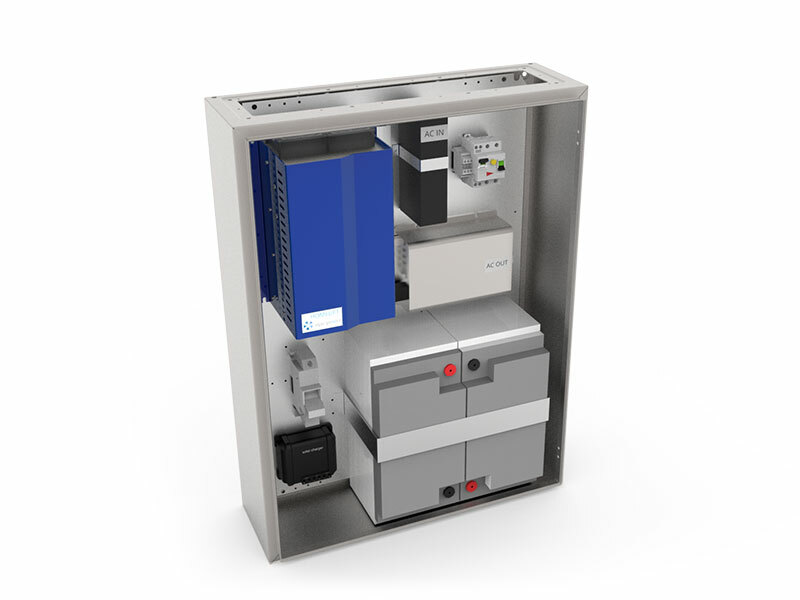 The included accumulators allow for hundreds of trips after a mains failure or lack of supply. The homelift can continue in normal operation for hundreds of trips even in case of a mains failure or blackout. The option of adding just one solar panel to the system makes the elevator “Allied with the sun” with net ZERO energy consumption during daylight. Recovering and storing the energy when elevator generates. Very large number of trips in case of mains failure. Avoids trapping in any situation. 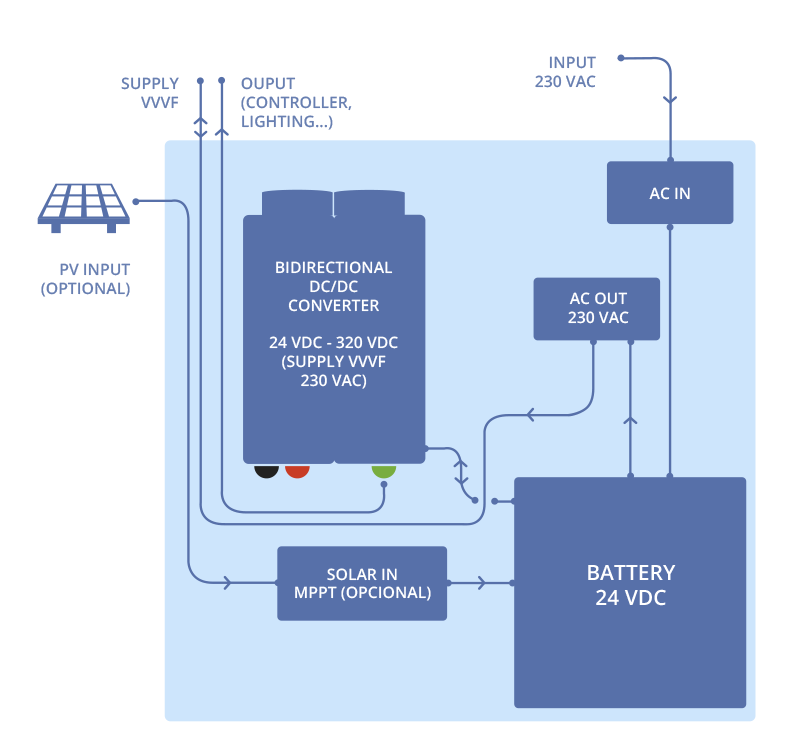 Very simple solar panel connectivity. Quick installation even for existing homelifts. Reduces peak power to 200 W.
The Homelift continues in normal operation even lacking mains supply. Reduces strongly the elevator stand-by. Expands life expectancy of the drive. Eliminates the need for an additional backup system UPS. Enables the use of solar energy. Suitable for new or existing elevators. Turn your Homelift into solar. By connecting a solar panel you can get your elevator to be independent of the mains. One single-phase 200 W input. 300 Vdc to feed the single-phase VVVF drive. 230 Vac to supply control, door operators, brakes, etc. 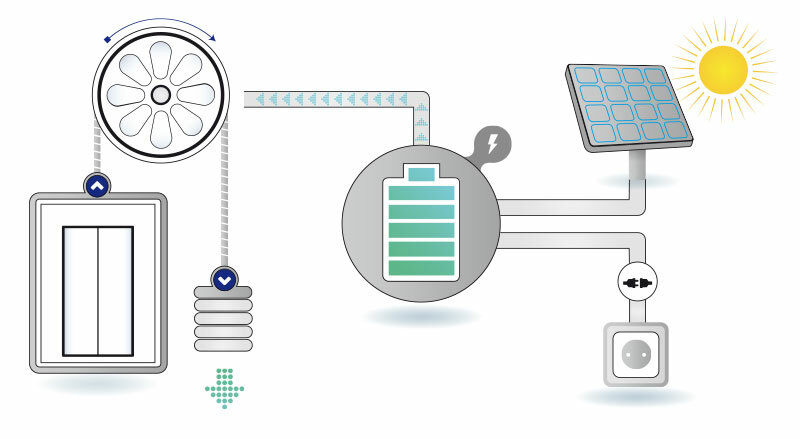 Optional input from solar panels. Extensive communication signals with the control such as for example, battery state-of-charge or energy consumption. Energy accumulators (24 Vdc) granting the elevator to operate for more than 100 trips lacking mains.